Yes, my dear friends, a man was spotted smoking weed at the new stadium and after he was busted, the guards didn;t even kick him out. Bad, bad Twins fan! 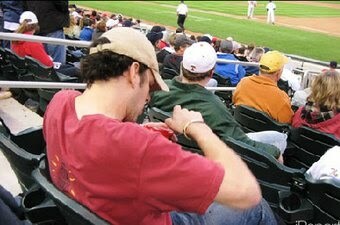 Here's how it all went down, according to this Deadspin article: " ...a concerned old person claims that during the Twins exhibition game against the Cardinals last Friday, a man in his section declared that he would be the first person to smoke marijuana inside the brand spanking new stadium. Then in the 7th inning, he indeed pulled out a fresh red pepper, carved it into a makeshift bong, then smoked some of God's green herb right there in his seat." Would the red pepper bong dude please stand up? Does this 'dude' know that construction workers have one of the highest rates of drug abuse? Sorry sister, I doubt you were the first. Totally! First one with a ticket!